Hi friends! I just got home from NYC, and have so much to share with you (mostly food related of course!). I knew when typing in the title that this will be one of my favorite blog posts I’ll ever write. It’s a culmination of the month of June that I got to spend in West Village living with my best friend Rachel (the real MVP), eating everything I could ever want at the best NYC restaurants, and taking plenty of SoulCycle classes to burn off all the tacos. June really was one of the best months of my life. The first weekend my coworkers and best friend Holly came to visit from all over the country for a long weekend of Smorgasburg, crazy Indian restaurants, speakeasies, and brunches. Another weekend Zack visited and we had the best pizza of our lives (talk about relationships milestones), and the final weekend Alina came up and we experienced a tasting menu that I’ll never forget. Anyway, enough with the sappyness, lets talk about food. It’s a given that New York City is one of the best if not the best food city in the world. Every day a new restaurant opens and Insider features some crazy video on a unicorn cannoli or some ridiculous creation restaurateurs are hoping goes viral on Instagram. If you go visit, the options can be seriously overwhelming, and that’s why I’m here. Roberta’s: Sweet, sweet Roberta, whoever you may be, I thank you for creating the most incredible pizza I will ever have. They don’t take reservations, so hang by the bar, have one of their impeccable cocktails, and usually a seat will open quickly. Order the Bee Sting and the Cheesus Christ, and expect tears of joy upon that first bite. Los Tacos No 1: Best tacos I’ve ever had, and for all of you DC residents, yes these are even better than Taco Bamba. You only have four options, but please don’t skip on the Adobada, which is the caramelized pineapple with pork (my favorite). 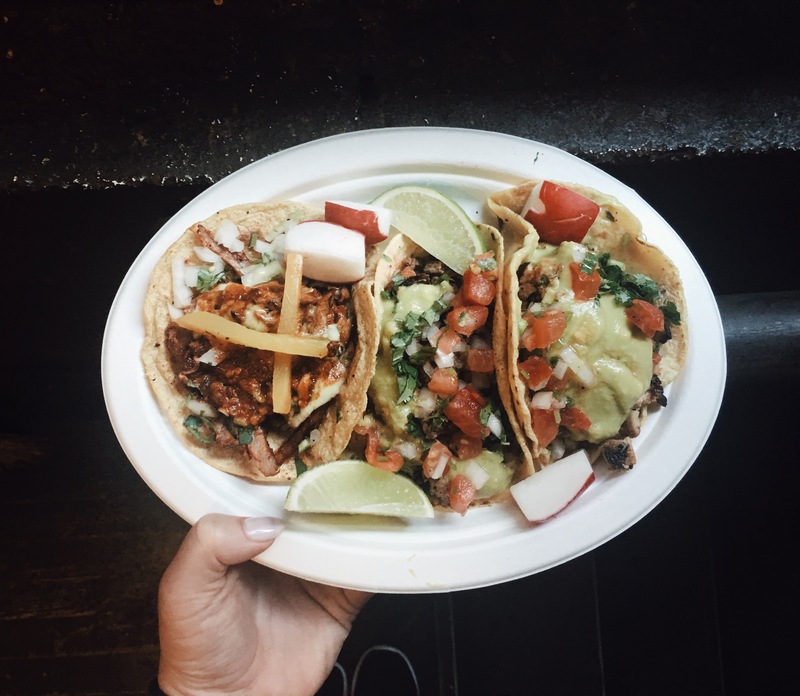 Located in Chelsea Market, make sure to stop by the gelato stand a few shops down for some mouth cooling ice cream after these spicy tacos! 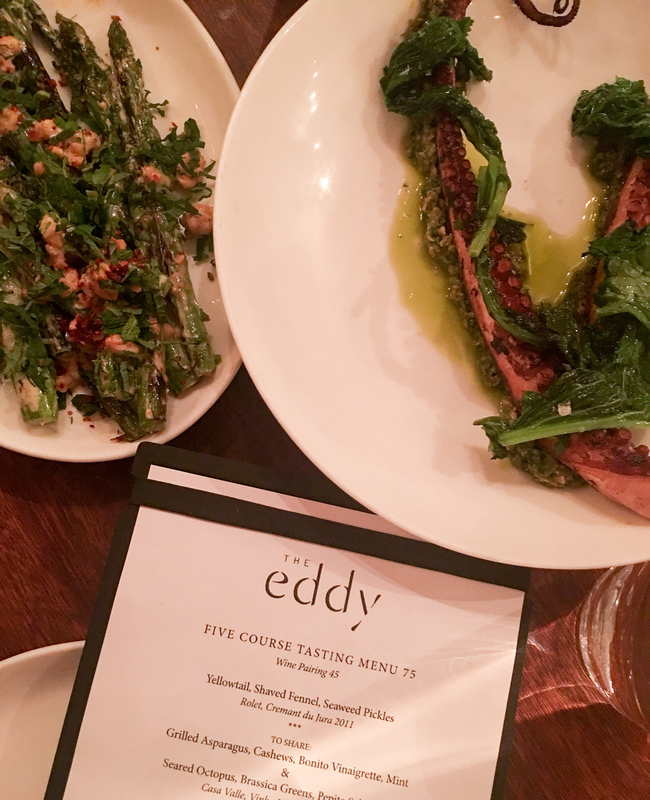 The Eddy: An unbelievable gem in East Village that has a surprisingly affordable tasting menu and unique cocktails. Some call it the Rose’s Luxury of New York, and I wouldn’t argue with that. The panna cotta with strawberry basil granita is filed away in my best dessert list, and the asparagus with cashews, bonito vinaigrette, and mint is how I want all of my vegetables to be served in the future. 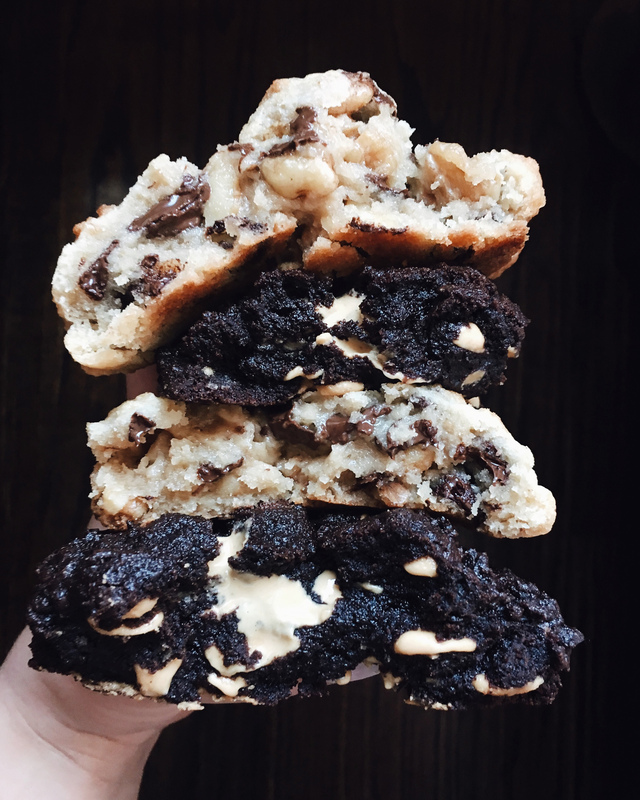 Levain: I know you’ve seen these cookies somewhere on social media, and believe the hype, they’re the best ever. I contemplated the trek to the Upper West Side to grab a famous chocolate chip walnut cookie, but I’m so glad I did. The chocolate peanut butter is a show stopper as well, and can easily feed a family of four. 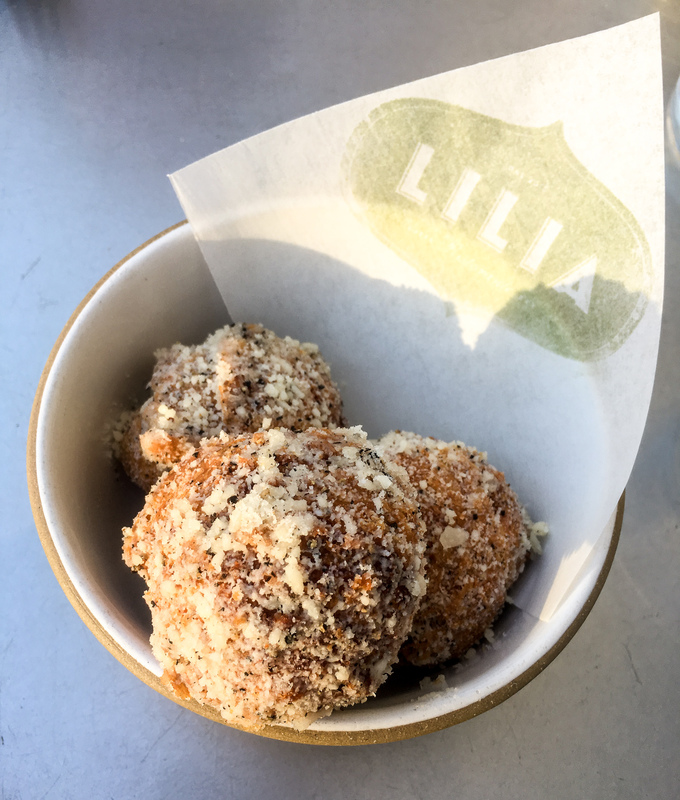 Lilia: Lilia is one of the best Italian restaurants I’ve been to. See the cacio e pepe fritelle below? They’re essentially savory donuts rolled in Parmesan and black pepper with a silky custard-y interior. Don’t miss the calabrian chili clams, the malfadini pasta, and the strawberry crostata. Absolutely worth the trek to Brooklyn. byChloe: You must think I’ve gone crazy listing a vegan restaurant in this list, but byChloe is an exception. 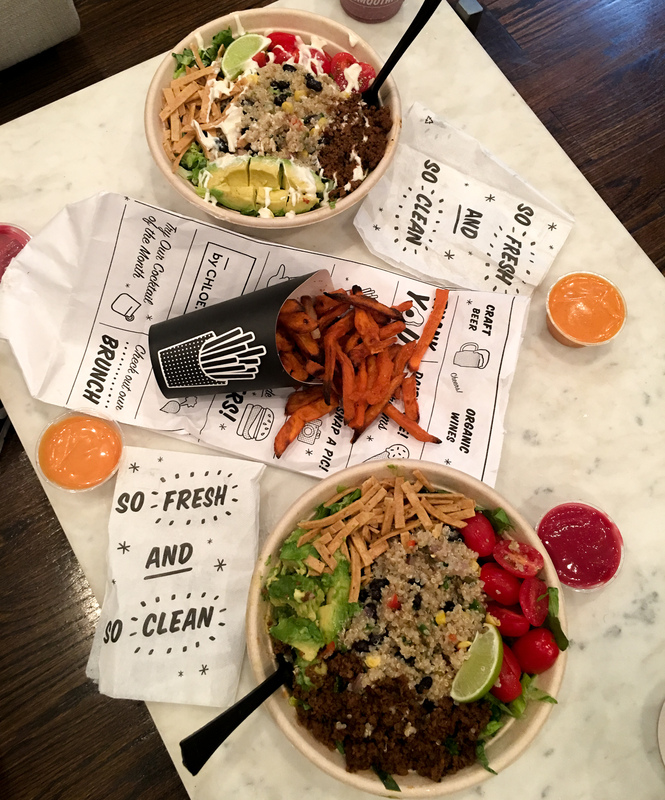 The taco salad you would swear has meat in it, and the air fried sweet potato fries are a perfect match for the vegan spicy aioli. This is what I ate on days where I needed a break from restaurant food (so at least once a week). Domo Domo: Rachel, Sam, and I did the Domokase which is Domo Domo’s version of an Omakase. 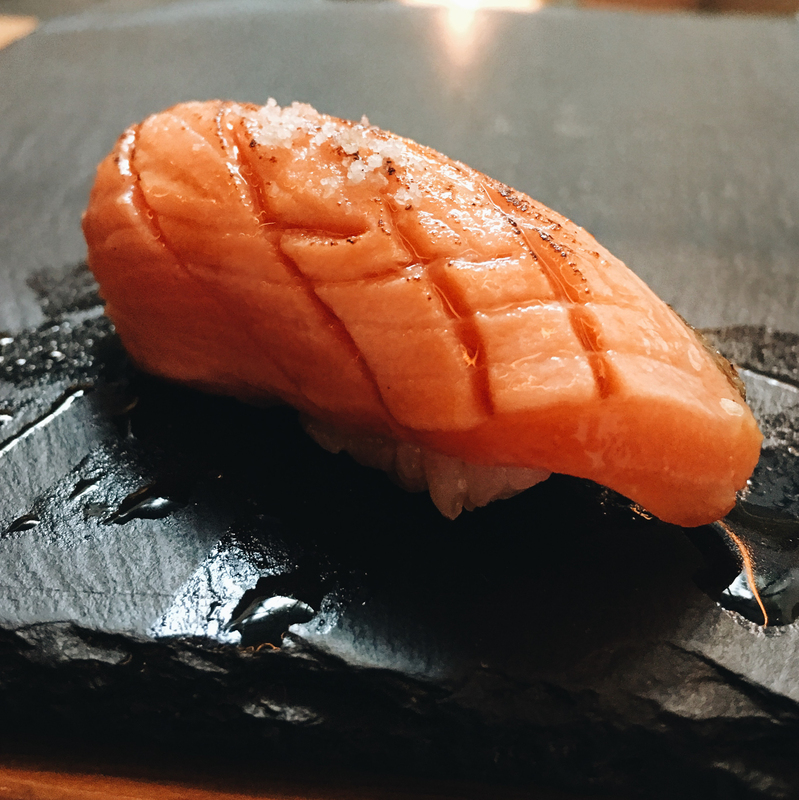 It’s essentially a sushi tasting menu, and at $75 it’s a bargain compared to what you’ll find elsewhere in the city. The scallop and yuzu foam was a bright punch of citrus and brine, and there’s no service quite like getting each piece of sushi handed to you right after it’s made. Pro tip: ask to sit at the sushi bar in the back of the restaurant. 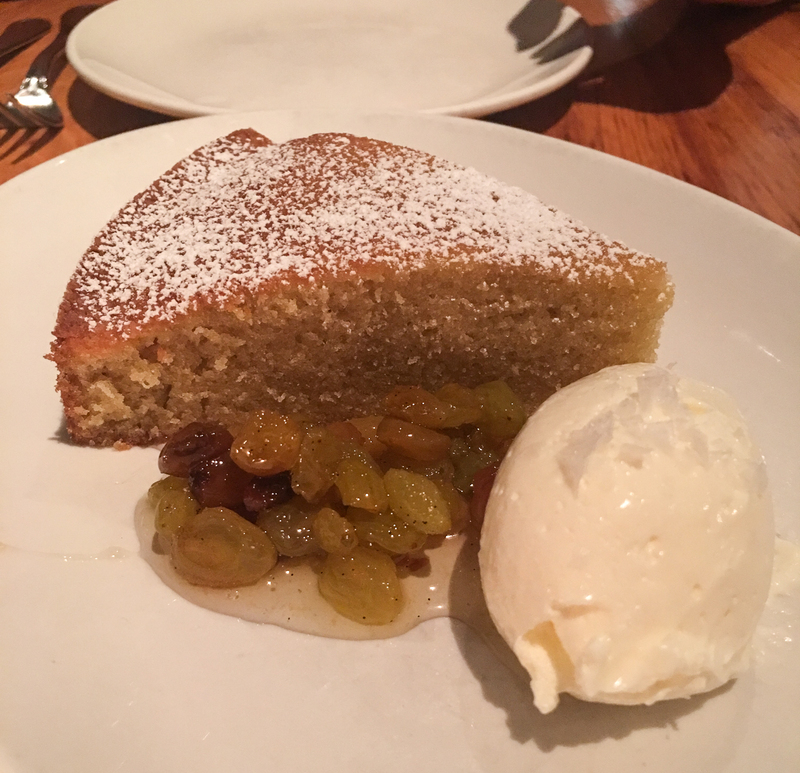 L’Artusi: Italian food has my heart, and L’Artusi definitely ranks in the top 5 I’ve ever had. Start with the wood roasted mushrooms with a fried egg and an unholy amount of shaved ricotta salata on top. Have the bolognese made with white wine for your entree, and finish this carb fest with the olive oil cake. The creme fraiche quenelle sprinkled with flaky sea salt is a genius accompaniment to the moist cake and sweet raisin compote. Make a res at least a week in advance. 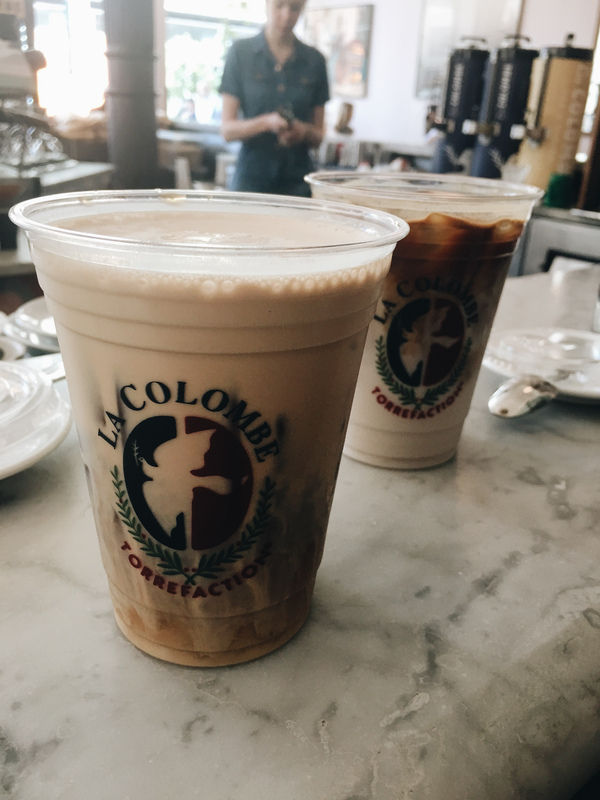 La Colombe Coffee: I’m not usually a coffee drinker since caffeine gives me more anxiety than I know what to do with, but I’ll take on the emotional roller coaster for La Colombe. They do a draft latte that’s unbelievably decadent, and add just a little of their demerara sugar syrup on the coffee bar for the perfect morning pick me up. My fav coffee is the black and tan. Try it, and you’ll never go to a Starbucks again. Ippudo Ramen: This is the top rated ramen place in NY, but I come here for the pork buns. 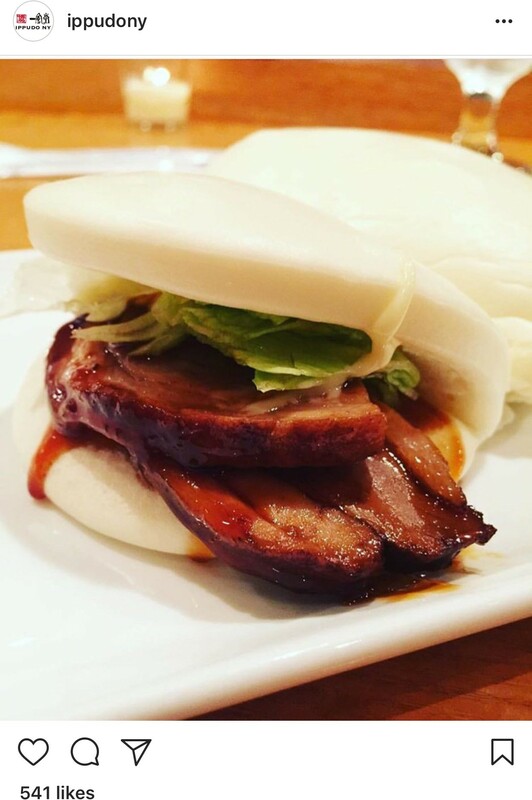 They’re simultaneously light and rich with soft steamed buns surrounding sticky hoisin pork belly. 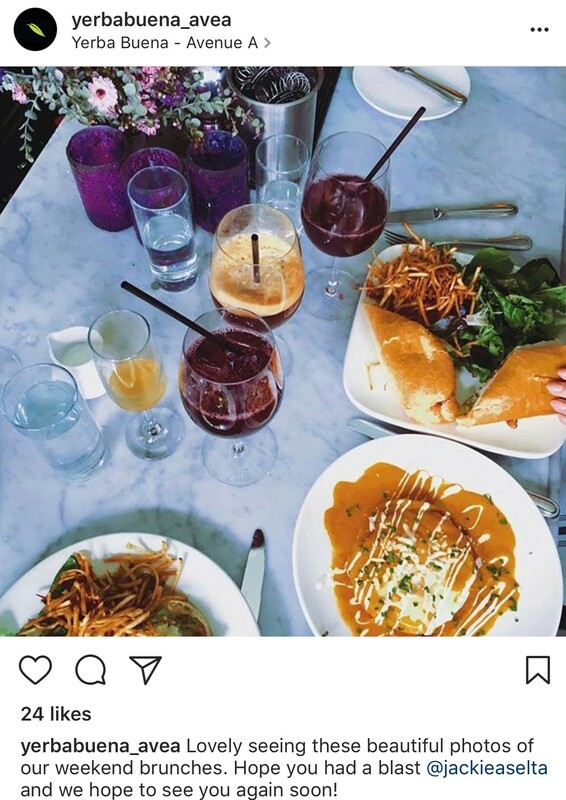 I ate mine so quickly I didn’t take a picture, so thank you Instagram for the photo below. Of course the ramen is also incredible, just come early since there’s always a wait. Banter: Australian coffee shops are a thing in NYC, and Banter is one of the best. 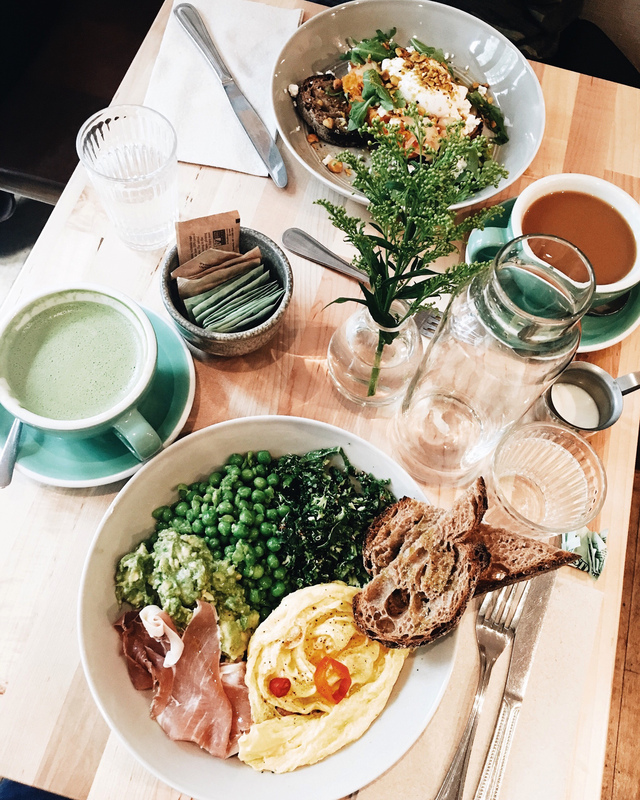 The sweet potato smash on sourdough as well as the golden folded egg bowl are two brunch favorites, especially paired with a matcha latte. Ask your waiter a complicated question, you’ll want to hear that Australian accent as long as you can. OatMeals: I know, I’ve gone crazy. WHY on earth is there an oatmeal place on this list..? Because it’s the best oatmeal out there. 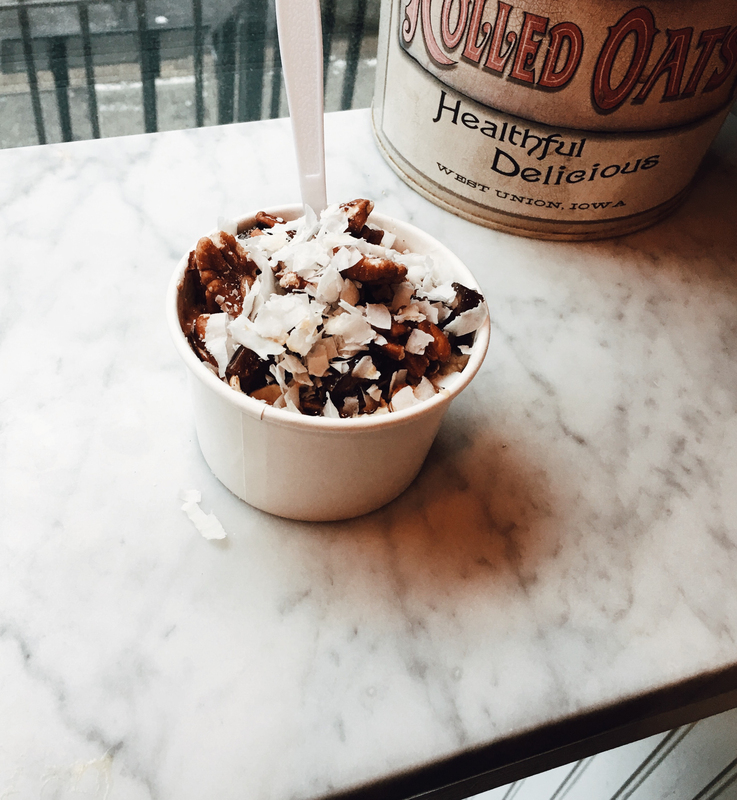 I go there for a hot date (the hot date oatmeal bowl that is), and it’s the perfect combination of creamy oats. sweet dates, crunchy pecans and granola, all topped with a drizzle of honey. One of my favorite breakfasts in West Village. 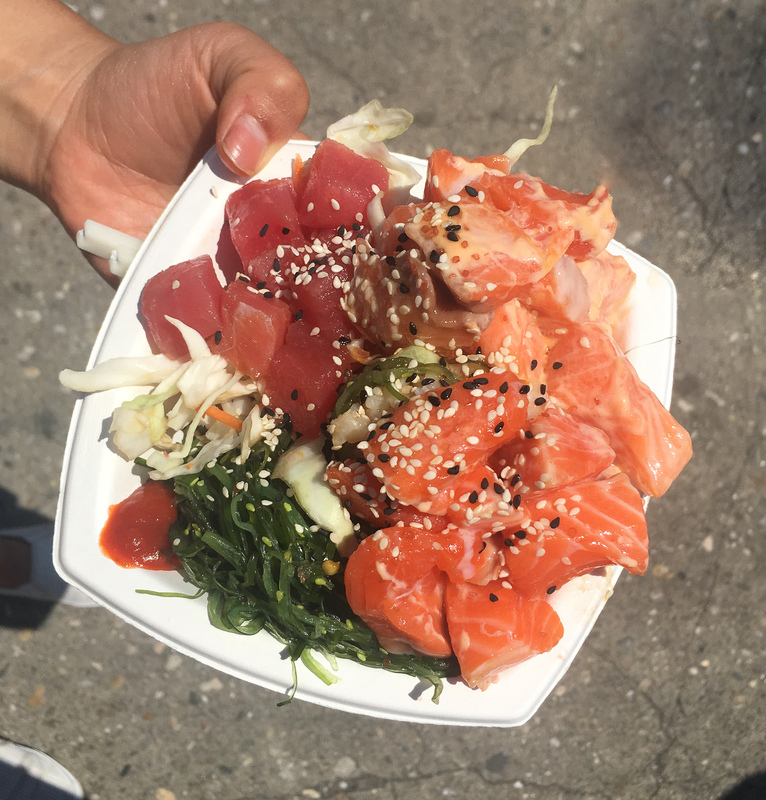 Smorgasburg: I could wax on for days about Smorgasburg. You’ve read about it in my previous NYC posts here, and I Insta way too many pictures of the food fest. For those who haven’t gone it’s an outdoor food festival in Williamsburg with a stunning view of the Manhattan skyline and hundreds of different vendors including Raclette cheese, the Ramen Burger, juices served in hollowed out dragon fruit, dumplings, and so much more. It’s a must do on Saturdays, just make sure to bring cash. Clinton St Baking Co: Clinton St is famous for their huge stack of pancakes with warm maple butter that looks excellent when drizzled over top of the pancakes for a slo-mo video. The wait is crazy, but we had no problem getting in closer to 2:30. 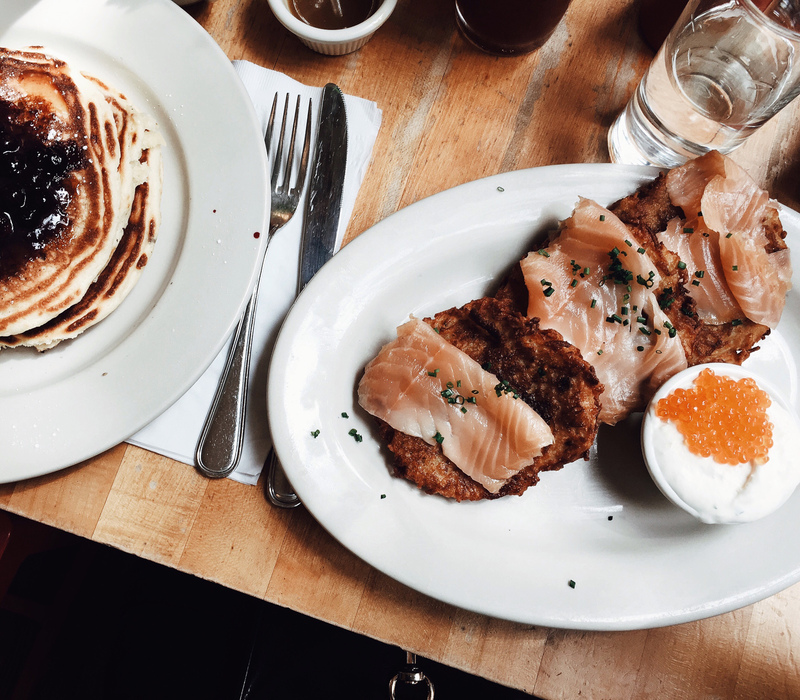 The smoked salmon potato pancakes with caviar are also fantastic. Noodle Pudding: I struggled to find good restaurants when I was living in DUMBO, but Zack and I came across this place one night and met the most amazing couple, Annalisa and Chez. We ended up eating dinner with them the rest of the night and marveled over the fresh pasta and steak with roasted garlic. Cash only. Dominique Ansel Kitchen (Soft Serve Window): I’m a HUGE almost stalker level fan of Dominique Ansel due to his cronuts and incredibly innovative pastries. He also opened a soft serve window in his West Village restaurant that serves just two of the most perfect flavors. 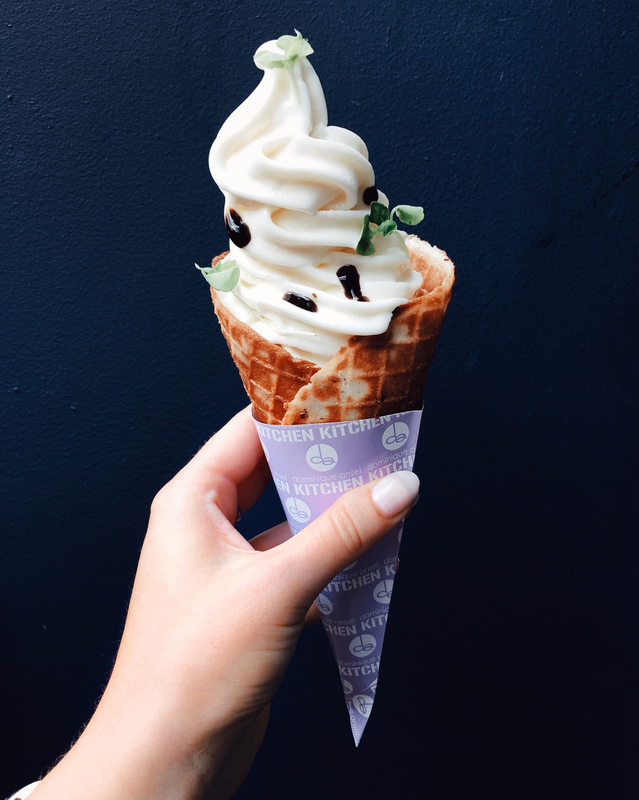 Get the burrata soft serve that comes with balsamic caramel, microbasil, and a confit strawberry in the bottom of the cone. It’s perfectly creamy without being cheesy, and the confit strawberry is the best surprise at the end. 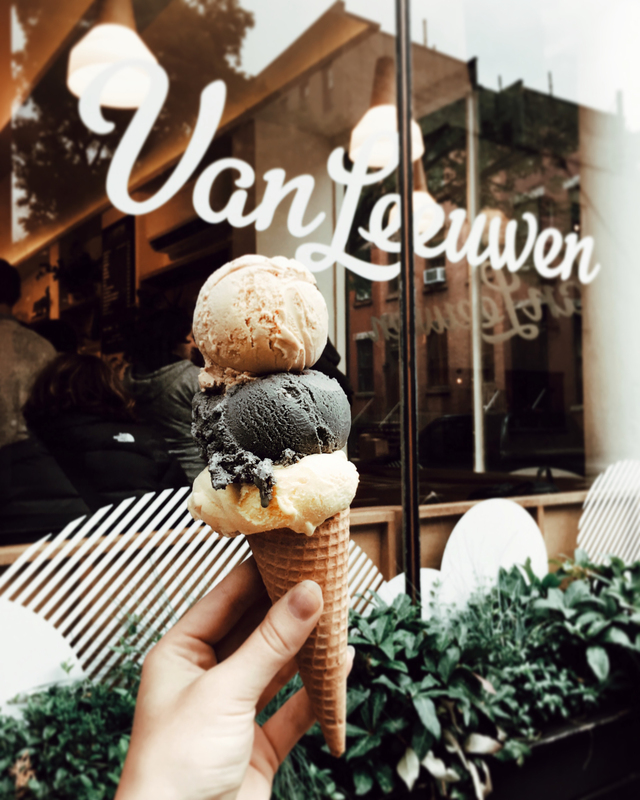 Van Leeuwen Ice Cream: Another West Village ice cream winner is Van Leeuwen that specializes in very unique flavors, passion fruit layer cake anyone?, and vegan flavors that don’t taste vegan. Another bonus, they encourage you to try as many flavors as you want which you best believe I took full advantage of. 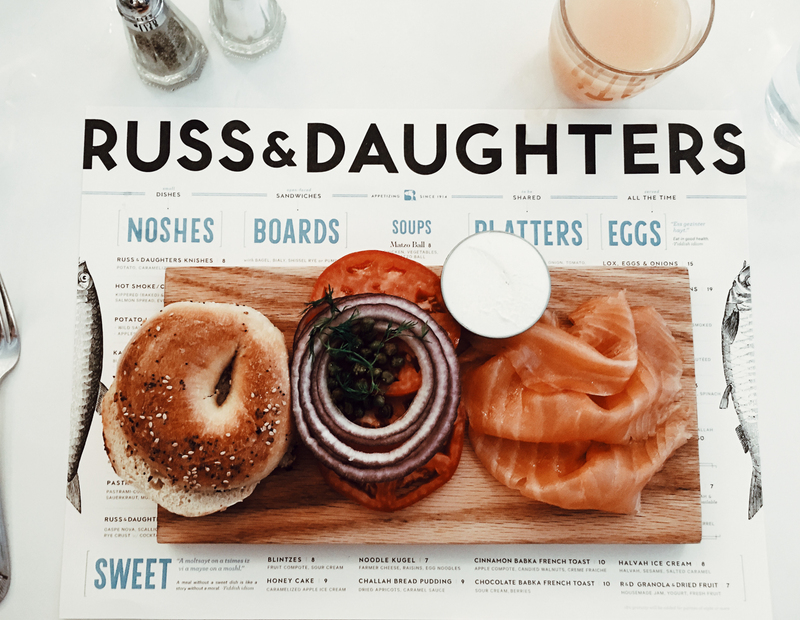 Russ and Daughters: There are too many brunch spots in Manhattan to talk about, but if you grew up in a Jewish family and know your way around smoked salmon, Russ and Daughters is your place. They don’t take reservations but put your name down and walk around SoHo to prepare to eat your weight in bagels and lox. Yerba Buena: I needed a taste of my beloved DC bottomless brunches, so Zack and I met Annalisa and Chez for brunch at Yerba Buena for a Latin fusion meal and drinks. The brunch food was incredible and the bottomless drinks were delish and very strong. I highly recommend splitting the stuffed pan dulce and the tres arepas, and you cant go wrong with a passion fruit margarita. Taco Mahal: A few months ago Rishil tagged me in an Insider video that featured Taco Mahal, a Mexican-Indian fusion fast casual restaurant that creates glorious Indian inspired tacos. 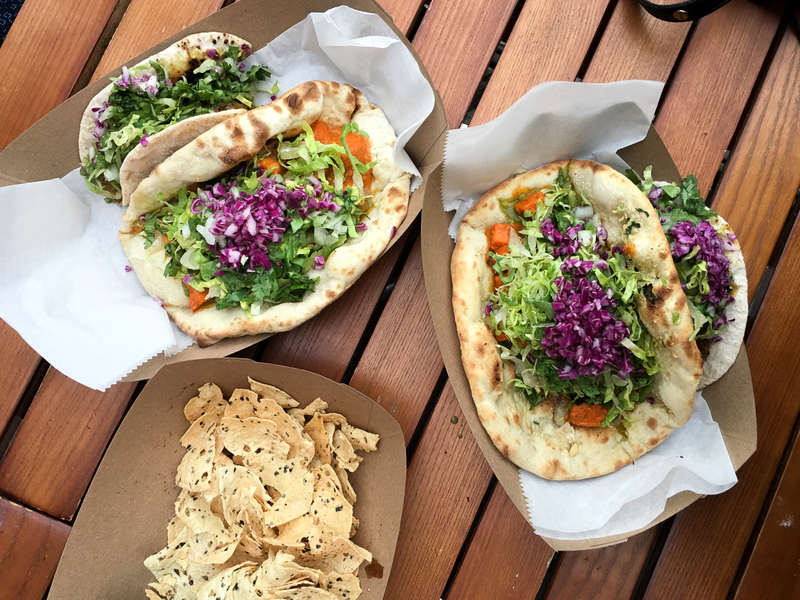 Fast forward to June and him and the rest of our coworkers came to visit, so of course we had to try the butter chicken in a naan taco. All I could think while eating was why hasn’t this been invented sooner? 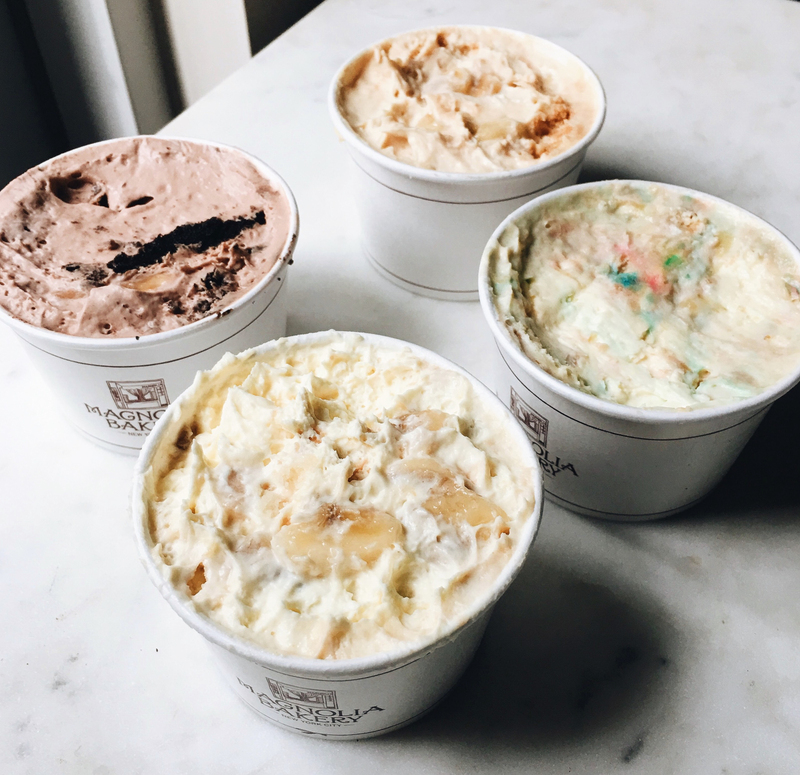 Magnolia Bakery: All you need to know about Magnolia Bakery is that the banana pudding is life changing. I know what you’re thinking, you probably could care less about this type of dessert, but I promise once you try a bite of the rich vanilla pudding flecked with soft wafers and fresh bananas you’ll realize it’s what you’ve been missing. Also, their Snickers cheesecake is definitely worth the trip. Panna II: Ok so Panna is by no means great Indian food, but it’s the most fun atmosphere for a party dinner. 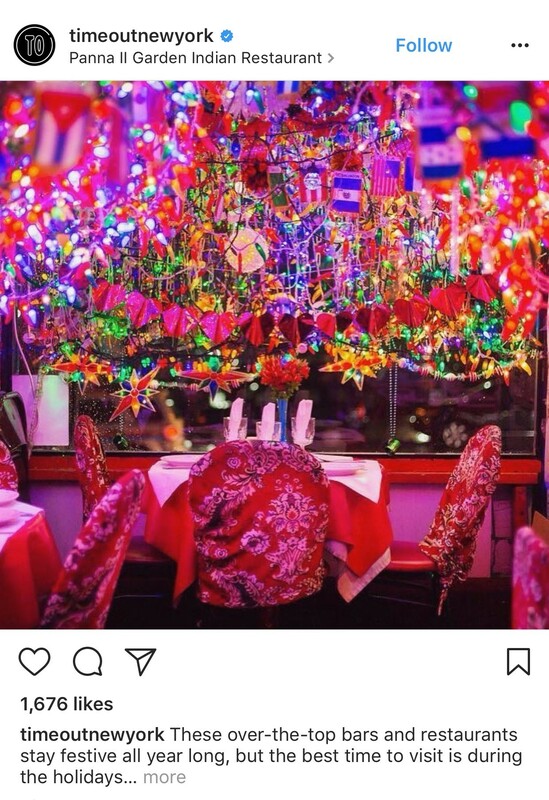 You may have seen pictures of it because it’s completely covered in Christmas lights and very Instagrammable. It’s BYOB, so grab your drink of choice and come here for a fixed price Indian meal that’s a fun way to start your night out. 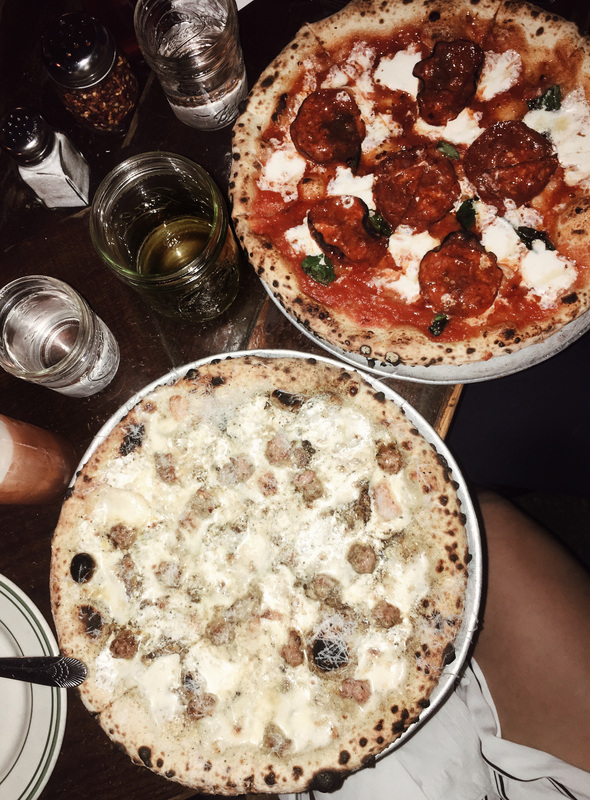 Baker and Co: Baker and Co is an Italian inspired restaurant in West Village that you’ll definitely want to model your next apartment after (exposed brick, white marble, and enclosed outdoor terrace). 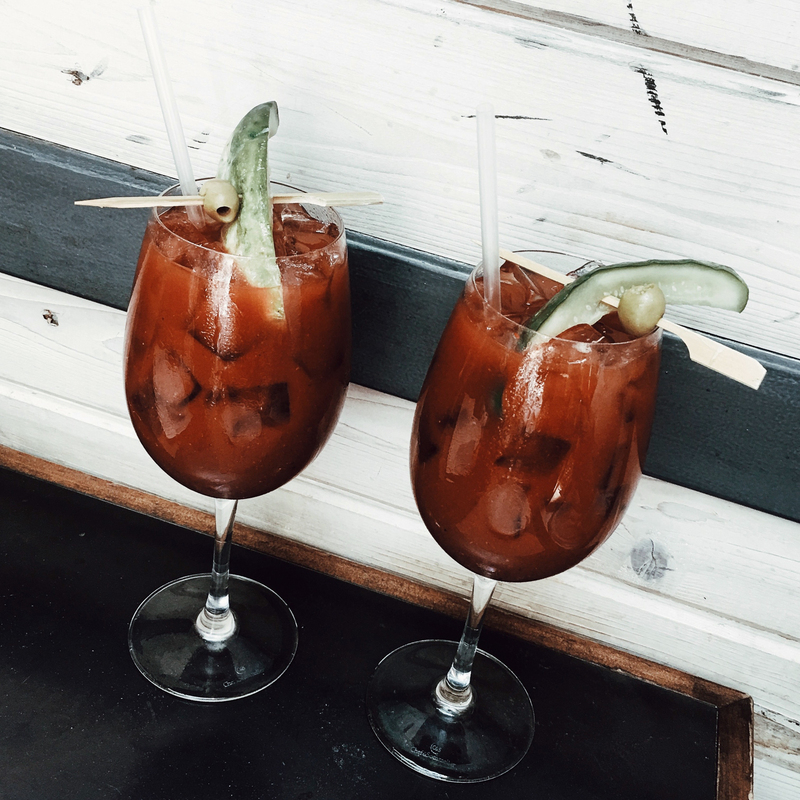 The brunch food is very solid, especially the baked eggs, but the real standout was the Bloody Mary. They don’t have their liquor license so the cocktail is made with beer and Vermouth, and has the most complex flavor I’ve experienced in a bloody before. The perfect hangover cure. Tacombi: Tacombi is a super cute Mexican restaurant in a few locations around Manhattan. 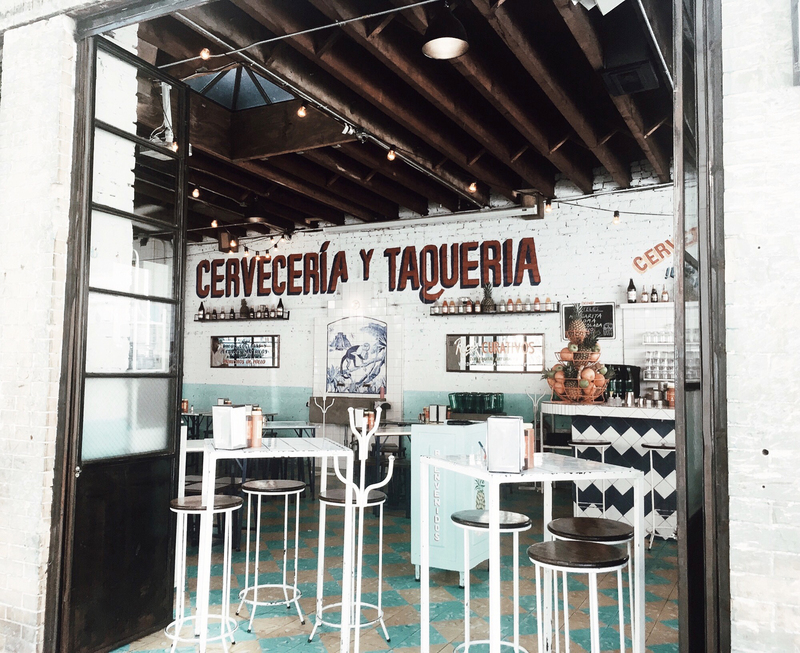 The tacos aren’t quite as good as Los Tacos, but it’s the perfect spot for a fun group dinner. Get a pitcher of the spicy margaritas, the crispy fish tacos, and a side of the Mexican corn. ISE Sushi: When I think early bird special I think of a movie theater in a strip mall offering 2 for 1 tickets to a Barbara Streisand movie. Thankfully this special is nothing like that. 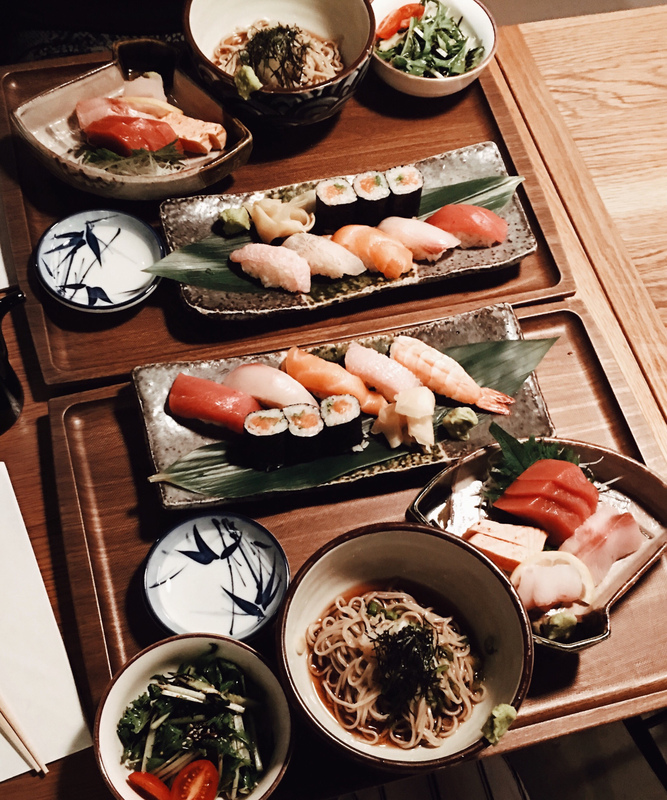 ISE in East village offers the best sushi deal EVER from 5:30-7: a salad, bowl of udon, sashimi, choice of entree, green tea, and dessert for only $28. Take a walk to Amorino Gelato after in case you need a second dessert like Rachel and I.
Taverna Kyclades: Normally I wouldn’t go out of my way to have Greek food, but Taverna Kyclades is absolutely worth the trek. 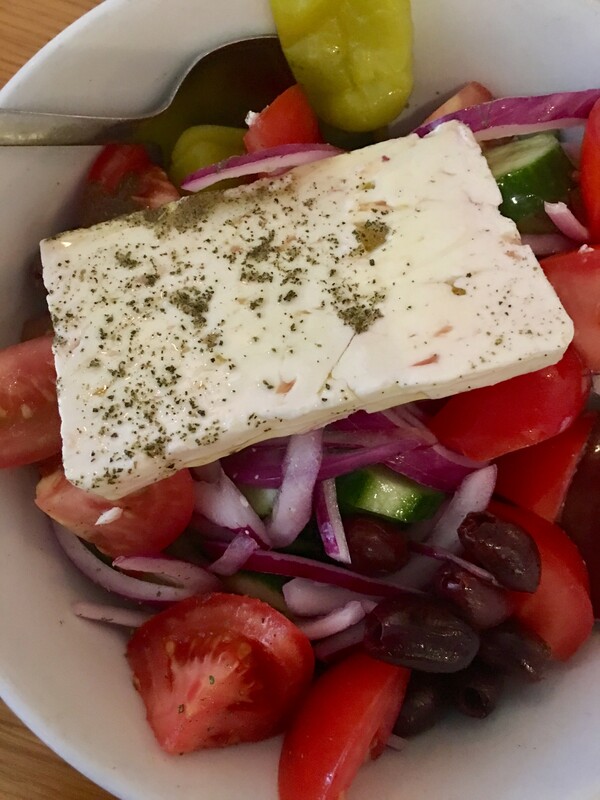 The Greek salad with the huge block of feta on top is a great way to start the meal, don’t miss the perfectly tender octopus, and make sure to share an entree since they’re huge. Also, the complimentary semolina custard they send over for dessert is so good I’d order it even if I had to pay. Joe’s Shanghai: If you’re looking for the quintessential Chinatown experience, look no further than Joe’s. There’s no reservations, you walk up and give them your name, and they call out your number as you wait in a back alley (not as sketchy as it sounds). 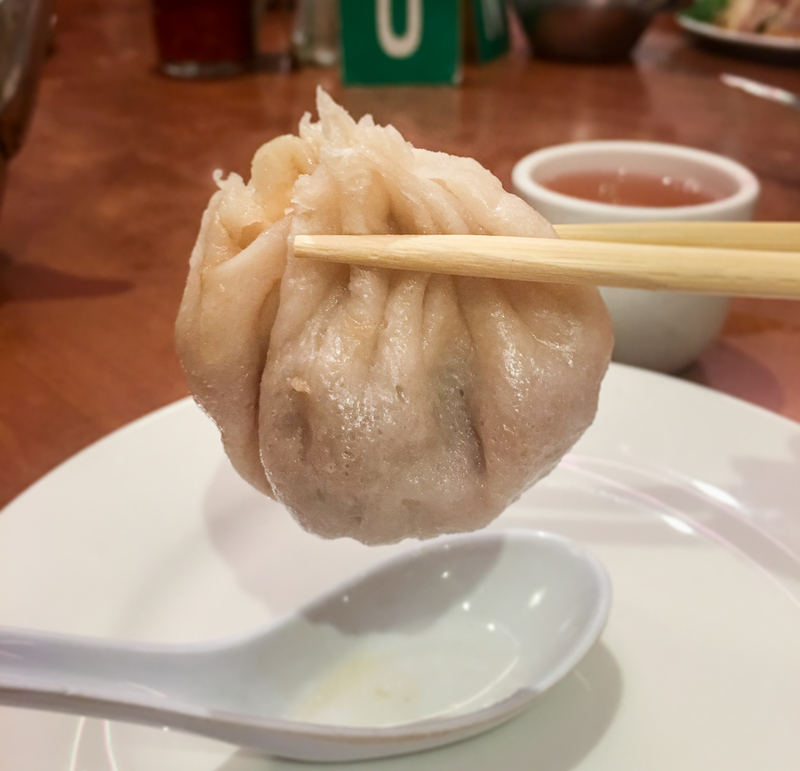 When it’s finally your turn to enjoy their glorious soup dumplings, you head inside to a communal table and place an order for these perfect bites. Easily the best xiao long bao I’ve ever had, but don’t forget to bring cash. 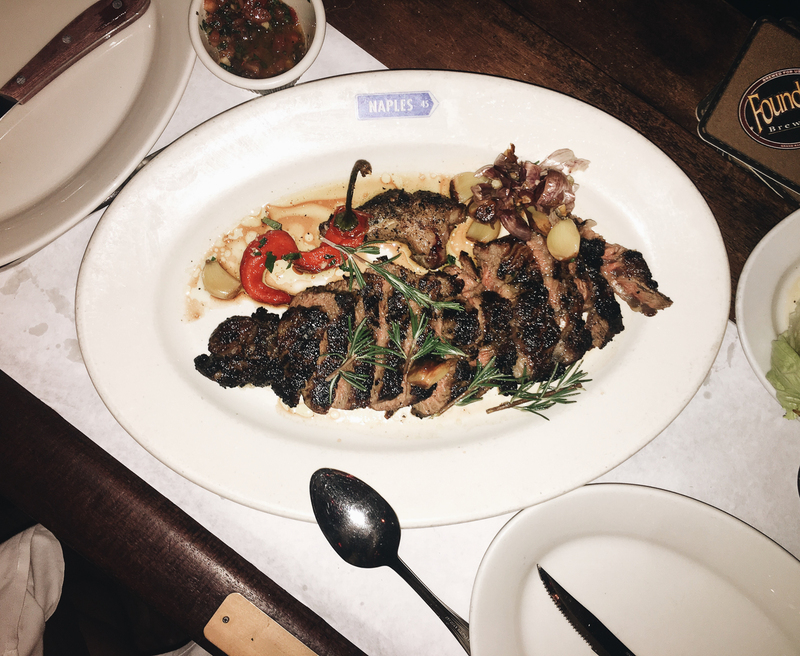 Bar Primi: Froze is infinitely trendy right now, and the place that started this trend is NoHo’s Bar Primi. 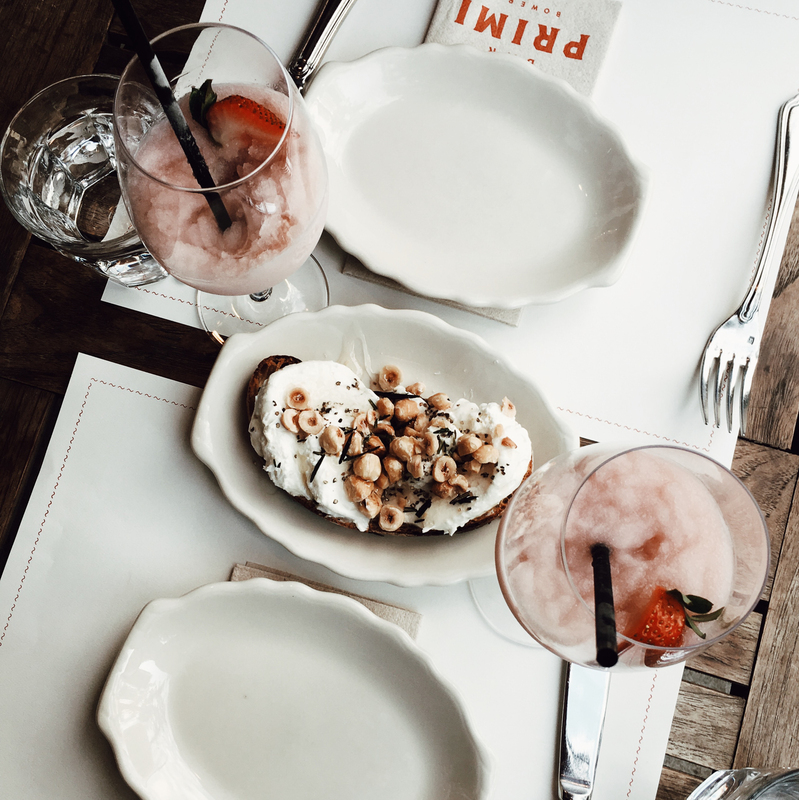 My idea of the perfect hour would be a glass of their vermouth spiked froze with an order of their ricotta toast topped with fried rosemary, truffle honey, and toasted hazelnuts. 5:00 perfection. The Garret: My favorite game as a kid was hide-and-seek, and I have a feeling that’s why I love speakeasies so much. 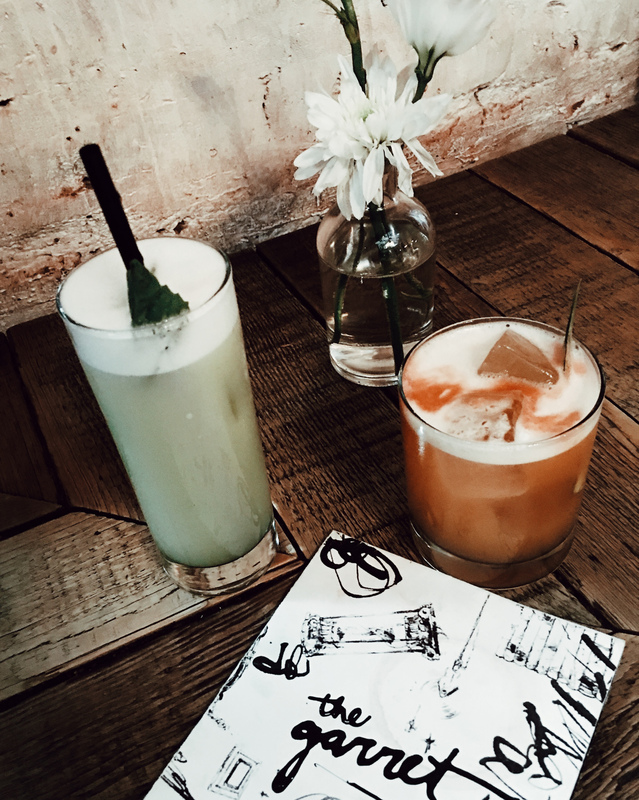 There’s nothing like discovering a hidden gem with a great cocktail list, and The Garret is just that. It’s tucked away on the second floor of a West Village Five Guy’s, and has a great vibe with even better cocktails. It’s a perfect first date spot. 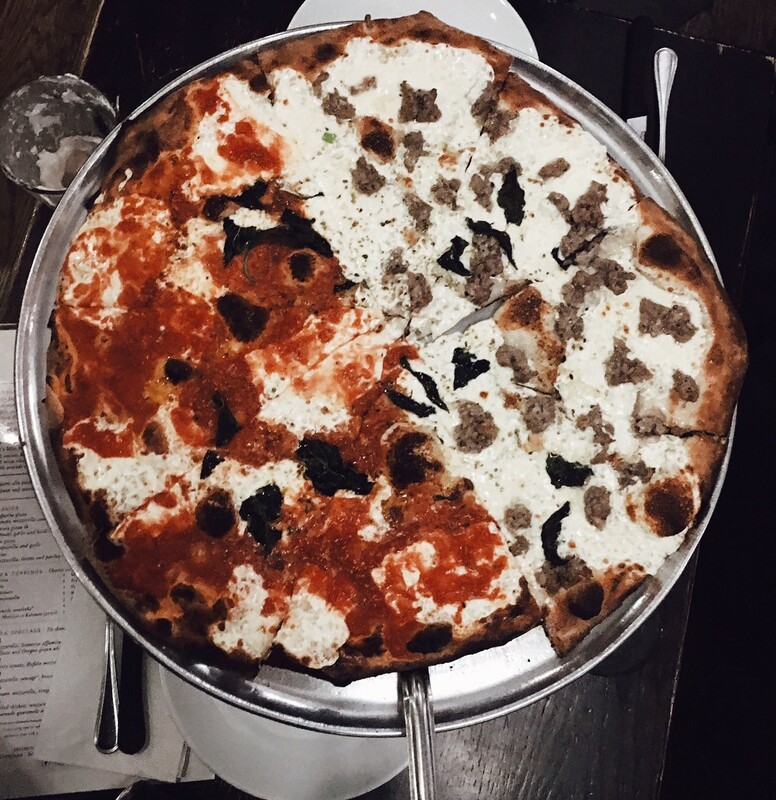 Juliana’s: If you’re ever in DUMBO, you’ve probably seen a crazy line outside of two pizza places: Grimaldi’s and Juliana’s. There’s a rivalry between the two places, but the lines will tell you which one to go to; Juliana’s is always longer. Grab a chocolate egg cream, order a large half margherita and half white pizza, and eat until you can’t breathe. The Brooklyn bridge and Manhattan skyline are just steps away, so head over and walk off those carbs after. 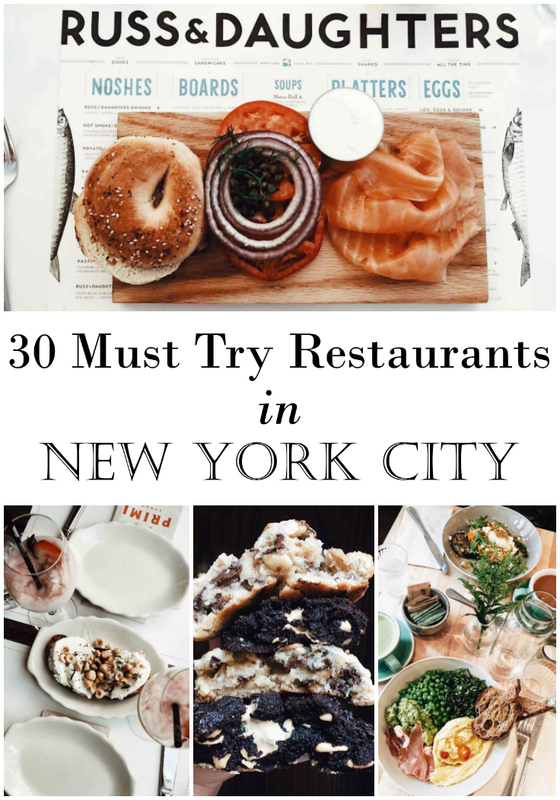 Phew, so there you have it, my top 30 restaurants in NYC! Please tag me on Instagram @haileywhiskedaway if you make it to any of these places and love them as much as I do! As for now, I can’t want to do a major detox, but I plan on doing a similar style post for some of my other favorite food cities as well. Have a great week and go have a burrata soft serve cone for me!